It does not matter whether a cropping system is high or low input, oriented to productivity or subsistence, conventional, organic, integrated, sustainable, permanent, fair, or whatever; beside land, intelligence, sweat and energy, four crop inputs are indispensable: seeds, water, fertilizers, and plant protection products. All the rest is optional. Biostimulants form part of this rest and face additional marketing challenges to those of required inputs. Growers are used to evaluate their supplies according to price, efficacy and, to some extent, service level of their distributor or of the manufacturer. They don’t need to be convinced that their crops need nutrition or pest control. Bio-stimulants, already a misleading and often misused denomination, must be sold under different claims, those of enhancing the plant metabolism in a manner that provides measurable and significant agronomic benefits other than nutrition or pest control. This is no straightforward endeavour. For such products, the regulatory environment is as disoriented as the market itself. As soon as phytosanitary defence mechanisms are in play, a product must be registered as a pesticide, with all the technical hurdles and costs that it entails. For example, while Trichoderma spp products were originally sold as stimulant, now only those companies having made this regulatory investment may put them on the market; and their competitive place remains within a narrow bio-fungicide category, for authorized uses only. Few countries regulate bio-stimulants and if they do, it will be as a special chapter within their fertilizer laws. A new European regulation is stalled since 2016 that attempts to find a common definition and to provide a set of general requirements for this quite heterogenous product group. Thus, biostimulants proliferate with a wild array of benefits that are claimed and not challenged by the obligation to demonstrate actual modes of action and their corresponding agronomic value. As no reference for effectiveness and quality is provided, the grower must make his own mind and evaluate if it is worthwhile to invest in applying a product that may add value to his crop in the form of yield increase, higher produce quality, precocity, abiotic stress resistance, or reduced consumption of other inputs. These five possible claims must be sustained by unequivocal proofs, mostly in the form of field trial results. And one has to trust that such results have been fairly evaluated. Depending on the mode of action, to prove efficicacy and efficiency is either very simple or then almost impossible. For example, roots inoculants have straightforward, observable modes of action and well reported outcomes such as nitrogen fixation or the extension of the rhizosphere. On the other hand, a mixture of various plant extracts may leave no observable trace in the plant and its effect may only be evaluated by sophisticated statistical analysis to distinguish it from mere fertilization. A “snake oil” suspicion may not be far away. The first marketing challenge is to be aware of that necessity, and to organize a set of representative field trials, preferably performed by independent or official institutes, to anchor claims in a valid scientific foundation. Having done that, two additional challenges must be faced: communication and distribution. As biostimulants do not [yet] form part of closed well-known categories, the communication around a product must begin with basic education, to explain e.g. what a mycorrhiza is, or to demonstrate a relation between soil composition, rhizosphere and drought resistance. Only then is it possible to show how a given product may offer a valuable and competitive solution. The need for such communication seems quite obvious for the biologists and the agronomists having developed the product. It is not as simple for the field sales representatives, the distributor’s sales and technical personnel, and the growers themselves. In the agricultural input market, distributors combine the tasks of logistical points of sales, cash collection, product promotion, and technical assistance to the growers within their catchment area. The arrival of products requiring investments in basic communication and follow-up to assess customer satisfaction represents a commercial and organizational disruption. Also, the sales representatives of the manufacturer must be able to get closer to the end-user which may be a source of tension with the distributor. Next challenge: the portfolio syndrome. When a company manages a large range of products it is customary to rank them according to their expected performances in terms of volumes, margins and supporting costs. Thus, business competition begins within a company for a product to obtain some place in the sun. Sales representatives will be driven by sales objectives, rarely by the maximization of hours spent in product communication. Therefore, the promotion of bio-stimulants within a diversified company may not get a top priority, despite of the underlying values that it may carry for environmental or safety reasons. A way of addressing this challenge is to split the organization, and to get dedicated teams interacting with different distribution channels than the traditional ones dealing with fertilizers or pesticides. Such split has also proven necessary to keep alive biocontrol products within multinational monsters. Doing that is not without conflict, and the holy grail of a holistic customer-oriented strategy from the plough to the fork may remain out of reach. Also, small companies focussed on a narrow product range may not have a sufficient critical mass to undertake all the required marketing efforts. The ultimate challenge is to gain repeated relationships with the end-users, those who decide to invest in products, apply them and reap benefits. Biostimulants are discretionary products; when a user can be convinced of the advantage in using one, he will make a purchase decision, albeit only as long as the otherwise prevailing economic conditions allow him to do so. Growers are highly sensitive in their spending; they know well when and where cost saving is more important than potential additional benefits. Exposed to many products with characteristics that are difficult to understand, or to trust, they have a natural aversion to unproven claims. Marketing of such products has therefore its costs and its time requirement, higher than other conventional agricultural inputs. Biostimulants, or plant enhancement products, add value to agriculture and contribute to its efficiency and sustainability. In addition to technical excellence, their growth potential will be fully exploited by addressing well the corresponding marketing challenges. 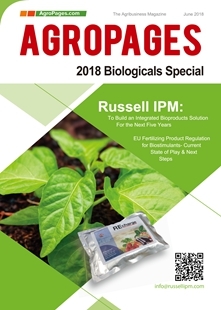 This article is from the 2018 Biologicals Special magazine, more exciting content, please download the magazine.